Maximum points for leaders Bracebridge Heath and challengers Woodhall Spa retained the status quo at the top of the Readers Lincolnshire ECB Premier League table. But lower down the order, a number of teams are hovering around the relegation zone. Bracebridge Heath’s batsmen seemed determined to do as little running as possible on the first really sunny day of the season as, needing 184 for victory over Bourne, they hit 154 of these runs in boundaries. Sleaford and Grantham fought out the highest scoring game, the home side amassing 333 for six thanks to an unbeaten 161 from Tim McIntosh – taking his season’s total about 600 runs – and 68 off 41 balls from Tom Shorthouse. McIntosh put on 94 with Shorthouse and 113 with Louis Kimber (47), finishing with 12 fours and seven sixes in his highest innings of 2015. But the London Road pitch also suited Grantham, Karanjit Bansal making 83 and Rohan Nurse 83 not out as the visitors’ innings closed on 267-7. This gave Grantham a very valuable 10 points which put them in equal 10th place with Grimsby, who faced a strong Woodhall Spa team at Augusta Street. Jack Luffman hit 70 and Malinga Bandara 79 as Woodhall finished strongly to post 277-8, a target that proved too high for Grimsby who, despite a huge effort from Steve Crossley with 72, were all out for 158. 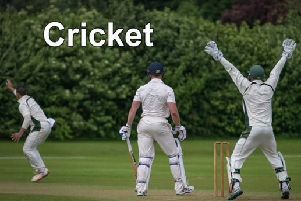 Matt Bradley took five wickets at Bracebridge Heath to help bowl Bourne out for a surprisingly modest 183, a total the home side overtook in 31 overs, Vikram Atri top scoring with 65. Market Deeping’s batting once again let them down after they restricted Lindum to 159-9 at St Giles Avenue. Ryan Sneddon was the architect of Lindum’s success, which moved them to seventh in the table, the Australian taking five for 58 as Deeping were bowled out for 114. Skegness also moved further away from the relegation zone after reaching 227-9 at home to Market Rasen. Jamie Epton hit 57 and Brendan Young 73 while Matt Rutherford took five wickets for Rasen to take his total for the season to 35. Young then took the first three wickets for 22 runs and Rasen never recovered, being bowled out for 105 and dropping to ninth in the table, 13 points up on Grantham and Grimsby. Spalding stay bottom despite the day’s best bowling figures from Dan Milgate who took seven Louth wickets for 57 runs. Louth were all out for 225 but the visitors were unable to match this and were bowled out for 161.